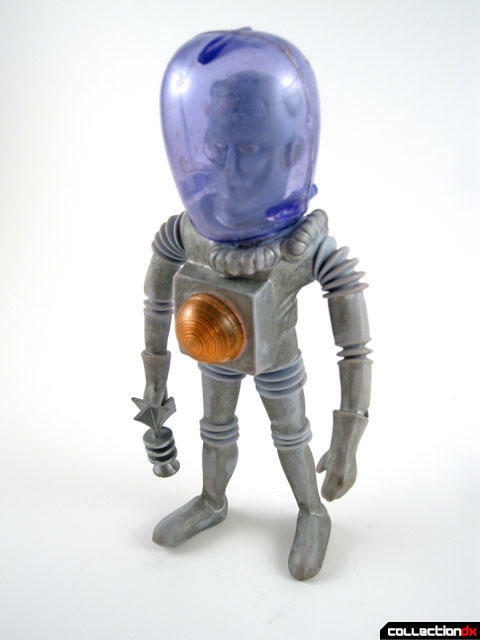 When the Four Horsemen and Onell Design combined forces to released their re-imagining of the classic Colorforms Outer Space Men figures, it thrust these iconic characters back into the spotlight and introduced them to a new generation of fans. Dormant interest was rekindled in other collectors such as myself who were aware of the toys, but were not actively collecting them. Previously, they were something I had always admired from afar but had never made the effort to actually acquire. That was going to have to change. Of course, being who I am, I couldn't do it the typical way. First I had to start getting the jigsaw puzzles, the Colorforms playset, and the Bullmark vinyls as well as the new toys. It's not that finding the original figures was that hard. The trick was getting them in a condition and price range that I was comfortable with. 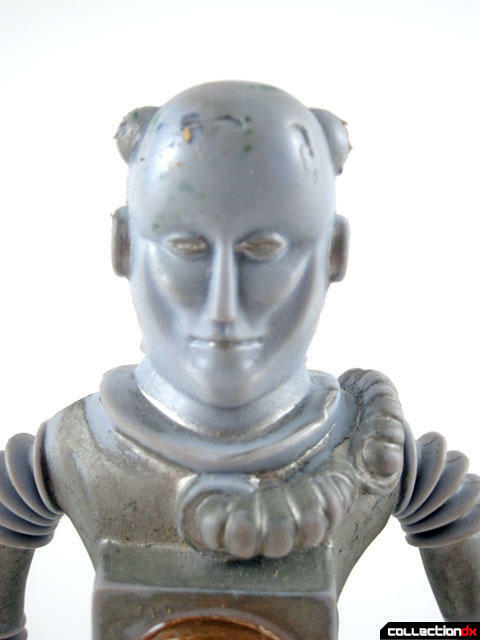 They are almost always missing their accessories and often have heavy paint loss or broken internal wires. Luckily, I managed to get a pretty decent Electron+ recently from a seller who did not list it well. 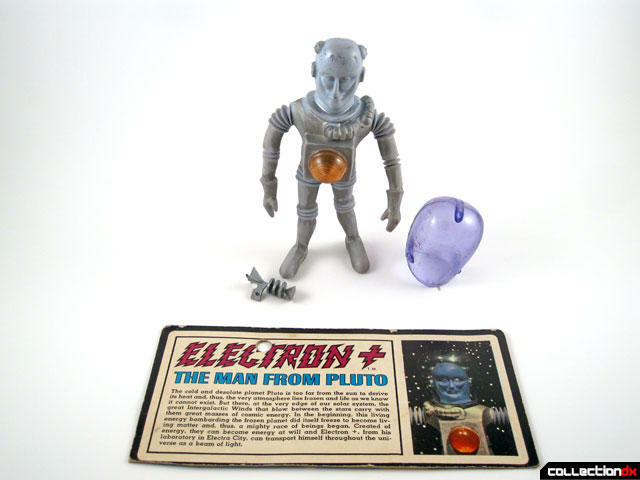 Although it's far from the best figure in the line (I think most would agree that Astro Nautilus and Colossus Rex hold that distinction), it is a personal favorite of mine since the design is modeled after the alien from the 1951 science fiction film "The Man From Planet X", which is a film I have always really enjoyed. Although the figure exhibits some paint loss, I felt that was a fair trade off for getting one that included the original helmet and weapon, even if the weapon is missing the piece from the front of it. For me, the real key part is the helmet. Any of the characters that are supposed to have helmets just don't look right without them to me. I mean, these guys are from space! They need their space gear! While the helmet is a two piece part, it actually can be slid right over the head pretty easily, which is good since I don't want to mess around too much with it and risk breaking any tabs or anything. I also haven't done hardly any posing of the limbs for fear of breaking any of the wire skeleton. The weapon is a pretty neat futuristic (well, futuristic for the 1960s that is!) gun that can be held in the right hand. There is a sharp tab on the handle that can be held in place by pressing it into the rubber of the palm of the figure's hand. One thing I never really knew until getting this was that the character is actually called Electron+, rather than the more colloquially used "Electron". It's clearly written with the plus sign on the original profile card. 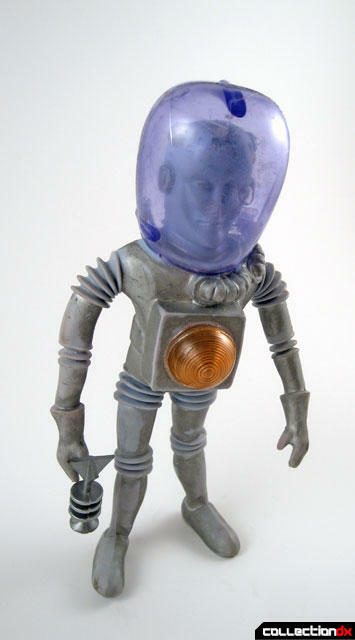 Keeping in scale with the Major Matt Mason figures of the day, this figure measures about 6.5" tall. 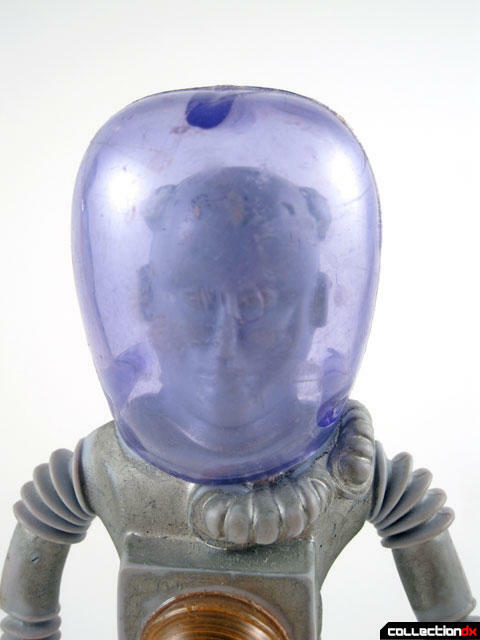 Unremarkable as that information may be, I think it's great that pretty much all the Outer Space men figures that have been released over the years are all their own distinct size. Someday I hope to have them all and when I do, I think that fact will make them display better since no version will infringe on the scale of another. When I got this Electron+, I'd hoped to acquire more immediately after, but something else more important came up and it didn't happen. So the next OSM review from me you'll see will be from Bullmark. I do hope to re-visit these again down the line and fill out our database with all the figures in the line. Amazing that it has lasted this long!